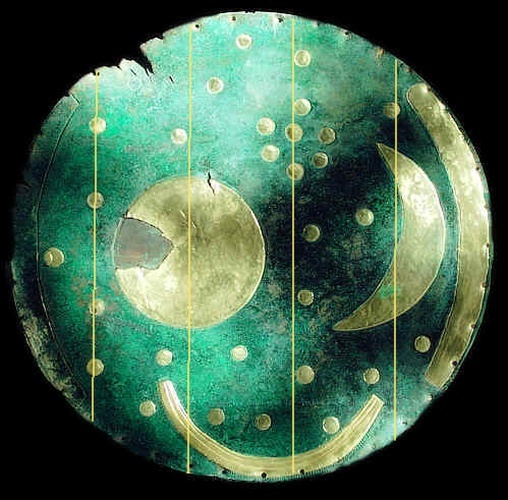 Is a bronze disk of around 30 centimeters diameter and a weight of 2.2 kilograms, with a blue-green patina and inlaid with gold symbols. These are interpreted generally as a sun or full moon, a lunar crescent, and stars (including a cluster interpreted as the Pleiades). Two golden arcs along the sides, marking the angle between the solstices, were added later. A final addition was another arc at the bottom surrounded with multiple strokes (of uncertain meaning, variously interpreted as a Solar Barge with numerous oars, as the Milky Way, or as a rainbow). 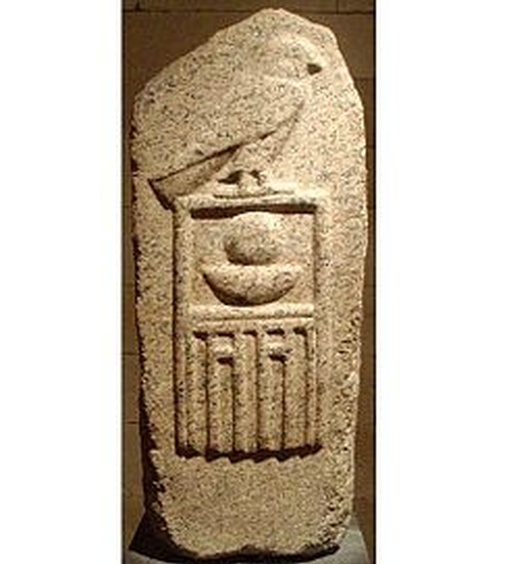 Nebra or Raneb is the Horus name of the second early Egyptian king of the 2nd dynasty. The exact length of his reign is unknown since the Turin canon is damaged and the year accounts are lost. Nebra's serekh name is of great interest to Egyptologists, since it is written with the hieroglyphic sign of the sun, which had not yet become the object of divine adoration during his lifetime. At the time of king Nebra, the most important religious cults were concentrated on the preservation of the dualistic equal status of the state patrons Horus and Seth. Nothing was more important than keeping that divine balance. The kings themselves were seen as the living representation of that godlike pair. The sun was seen as a celestial object controlled either by Horus or, as in the case of king Seth-Peribsen, by Seth. Therefore, the sun was no independent deity yet. The first definite proof of the existence of the sun-deity Ra occurs at the beginning of the 3rd dynasty during the reign of king Djoser in the names of high officials such as Hesyre. And the first definitive detectable proof for a fully established royal sun cult occurs under king Radjedef, the third ruler of the 4th dynasty. He was the first king who connected his birth name with the name of Ra, starting the great religious belief that Egyptian kings were the living representation of the sun alongside Horus and Seth. Therefore, Nebra's Horus name is problematic regarding its translation and meaning. The typical translation of Nebra's name as "Ra is my lord", which would be read "Raneb", is questionable, as this would assume that the Sun was already being worshiped as an independent deity. Consequently, Egyptologists have proposed the translation "Lord of the sun (of Horus)" which is read "Nebra" and implies the pharaoh's rule over the Sun (as a celestial body), which was indeed also under Horus' or Seth's control. Any solar religion or solar symbolism were not yet established in any useful form and it is now thought that king Nebra might actually have been the first king who adopted extended religious thought about the sun and the sky. Is a project focused on sharing knowledge through music. Influences range from Pink Floyd to Carbon Based Lifeforms, from rock to electronica. 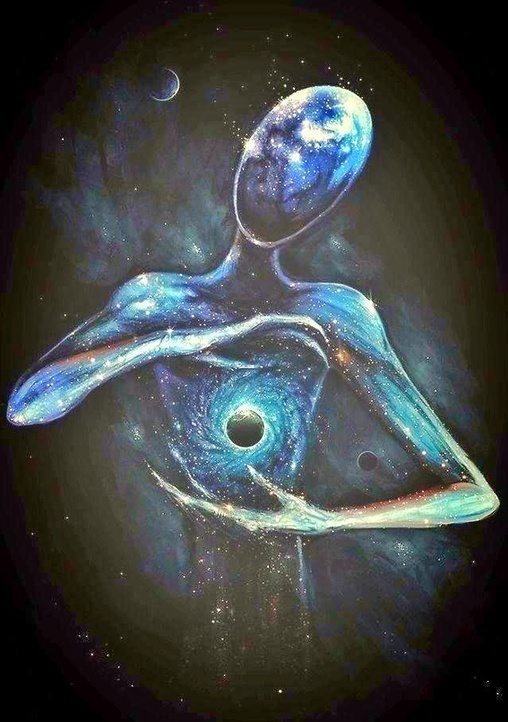 The music is imbued with universal messages coming from people such as Alan Watts and follows the 432hz tunning principle. Nebra is a song part of their album Web of Live (432 Hz).